Family stability is a prerequisite for a number of social outcomes that policy makers care about, not the least being child well-being and inequality. Still, the underlying factors influencing marital stability are not well understood. In their new discussion paper, IZA Fellows Jan Kabátek and David C. Ribar analyze a rather unusual suspect: the wedding date. Weddings on Valentine’s Day are incredibly popular. This is also true for dates with the same day/month/year (e.g., 11/11/11 – if you celebrate your fifth anniversary today, you will know) or a sequence like 01/02/03. 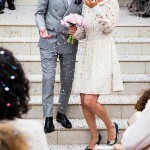 In the Netherlands, where the study is based, the authors found that of the 1.1 million marriages from 1999 to 2013, on average, twice as many weddings occurred on Valentine’s Day than on any of the surrounding dates in the month before and after. 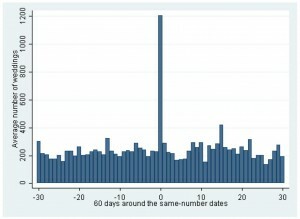 At least four times as many weddings occurred on the average “same-number date” than on most of the surrounding dates. Unfortunately, weddings starting on such special days are also much more likely to end in divorce compared to weddings on ordinary dates. By their ninth anniversaries, 21% of Valentine’s Day marriages and 19% of same-number-date marriages had ended, while only 16% of ordinary date marriages had failed. Why does the wedding day play such a big role? “Putting superstition and numerology aside, it is hard to pin a causal explanation on the wedding date itself. Skeptics might go farther to argue that dates shouldn’t matter at all,” Kabátek and Ribar state in their study. Still, the authors suggest that the choice of a wedding day can give clues about the commitments of a couple. Choosing a wedding day based on outside factors potentially indicates a lower commitment to the marriage’s relationship than choices shaped by attributes of the couple itself. These choices, therefore, may indirectly reveal information on the expected quality of relationships. Furthermore, the researchers find that couples who marry on special dates are less alike than couples who marry on ordinary dates. They also have other vulnerabilities, such as lower levels of schooling. However, statistical analyses that control for these differences still find that divorce risks are higher for couples who marry on special dates. The results are consistent with family relations theories which predict that partnerships that are shaped by external considerations will be more vulnerable than those shaped by internal characteristics of the couples and the quality of their relationships.